If anyone ever doubted that electric cars were the future, those concerns can now officially be laid to rest. 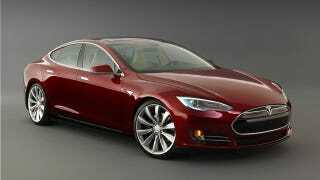 Tesla's luxury Sedan, the Model S, has just captured one of the auto industry's most prestigious awards by taking home Motor Trend's Car of the Year honors for 2013. It marks the first time that an electric car has taken the top prize — a vehicle that doesn't run on gas or have an internal combustion engine. The best energy consumption figure we've returned is 118 mpg-e for a 212-mile run from the eastern fringe of the Los Angeles sprawl to Las Vegas, Nevada. For the 313 miles of road loops during the COTY evaluation, where the car was driven at normal speeds by all the judges with the air-conditioning running, it averaged 74.5 mpg-e. Impressive numbers, especially considering the 4766-pound Tesla Model S Signature Performance version will nail 60 mph in 4.0 seconds and the quarter in 12.4 seconds at 112.5 mph, with a top speed of 133 mph. But as noted, Tesla's luxury Model S, a car that's covered by over 250 patents, comes at a hefty price: USD $58,570 (base). This puts it up there with the entry-level Mercedes-Benz E-Class, BMW 5 Series, and Audi A6. So, as exciting as it is to see an electric car win this prize, it's still not something most people can afford. Needless to say, the next great milestone for a Car of the Year will be in awarding one that's more reasonably priced. But for now, the Model S will remain the kind of vehicle that's reserved for those who can afford it — and for those who want to tie performance and good looks with an environmental sensibility. And yes, the company is named after that Tesla. Which is pretty cool.